"... dedicated to preventative Maintenance for the restoration and preservation of Asphalt." We offer over 25 years of dependable service, modern equipment and trained personnel to service all of your asphalt and concrete maintenance needs. Lines and Signs, Inc. is a family-owned business that was founded 25 years ago based on the concept of offering customers quality services at competitive pricing; and today we continue to hold true to those very same values. 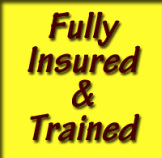 We are fully insured, serving businesses that are not only located on the East Coast but around the Country. There is no business that is too small or too large for Lines and Signs, Inc. to satisfy. Our qualified and fully trained staff maintain the highest standards of workmanship with your needs in mind. We work with the latest technology in equipment for preparing for crack-repair seal coating and asphalt rejuvenation. We use only asphalt rejuvenating products that can pass FAA-E632, ensuring your complete satisfaction. We supply and install any N.J. D.O.T. signs to suit your needs. Looking for a custom sign? No problem - our custom signs can be copied from any photo or blueprint and digitally printed for your needs. While we specialize in construction site signs, we also make banners, temporary signs, mast signs, and personalized lettering. Other safety items we supply and install are: bollards and guard railings, both wood and steel. Traffic control signs are 3M reflective facing and inks with State approved aluminum. All sign poles are N.J. DOT. Whether commercial, industrial, public, retail space or apartment complexes we our staff is equipped to accommodate any sized job, meeting your city and/or state regulations as needed. Whether you need new layouts, repainting of roadways, a parking lot, handicap spaces, fire zones, etc. we are experienced, staffed, and ready to begin your project. We offer paint, both oil and latex, thermoplastic, epoxy, and BEST of all, MMA, the longest lasting coating. To help us better in reaching others who may be interested in our services, please tell us how you found our website. If none of the options apply, please select 'other' and enter the details in the block below this one. Thanks! If you selected 'Other' above, please tell us where or how you learned of us. Thank you!